Biocorrosion problems in the marine environment: New perspectives; Surface analytical techniques applied to microbiologically influenced corrosion; Electrochemical and atomic force microscopy studies of a copper nickel alloy in sulphide-contaminated sodium chloride solutions; The use of in-situ infrared spectroscopy as a probe for investigating corrosion reactions; Scanning electrochemical microscopy (secm): Its application to the study of localised corrosion; Marine biofilms on stainless steels: Effects on the corrosion behaviour; The influence of chloride ions on the corrosion performance of dhp-copper and 90/10 copper-nickel-iron; Microbial corrosion: Effect of microbial catalase on the oxygen reduction; New anticorrosive pigments*; Quantum chemical study of nitrogen and sulphur containing substances as inhibitors of the corrosion and hydrogenation of steel; Improved sacrificial anodes for the protection of offshore structures; Electrochemical evaluation of coatings for marine corrosion control; Metal filled composites as protective coatings against marine corrosion. 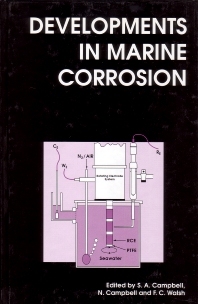 The diversity of subjects involved in marine corrosion and fouling processes are evident in the approaches and techniques described in this book. An improvized understanding of biologically influenced corrosion and fouling processes is essential to the development of better corrosion protection systems, and this book shows new perspectives in our appreciation of these subjects. Equally, powerful microscope imaging, surface spectroscopy and electrochemical techniques have become available and are providing new information on metal surfaces experiencing fouling or microbial corrosion. Examples include confocal laser microscopy, scanning probe microscopy, Fourier Transform infrared spectroscopy, scanning electrochemical microscopy and scanning (or vibrating) reference electrode techniques. Advances in knowledge of biocorrosion processes have enabled improvements in corrosion monitoring and protection strategies. Examples include metal or polymer coatings and the use of corrosion inhibitors and biocides. This book aims to provide a contribution to existing literature on biocorrosion in the marine environment.